When asked about their operating plant’s capabilities, most aggregate producers either know exactly how much material the plant makes, but don’t know what it is capable of making – or they know what the plant’s capacity may be, but don’t know its actual production. If you don’t arm yourself with both knowledge of your plant’s capacity and an accurate measure of your production output, you can’t truly manage your production process. In reality, most plants are underutilized. This is where process flow simulation software is a useful tool that producers, engineers, equipment manufacturers and equipment dealers can use to simulate the flow of material through aggregate and mining operations. The software enables users to build both simple and complex crushing, screening or washing plants on their computer screens. By choosing equipment types and settings, monitoring flow rates and gradations at desired points, and then virtually running the plant, users can compare calculated results to actual field results. When validated by field sampling and measurement, the data produced with process f low simulators can become one of the most critical components of a plant’s performance measurement. 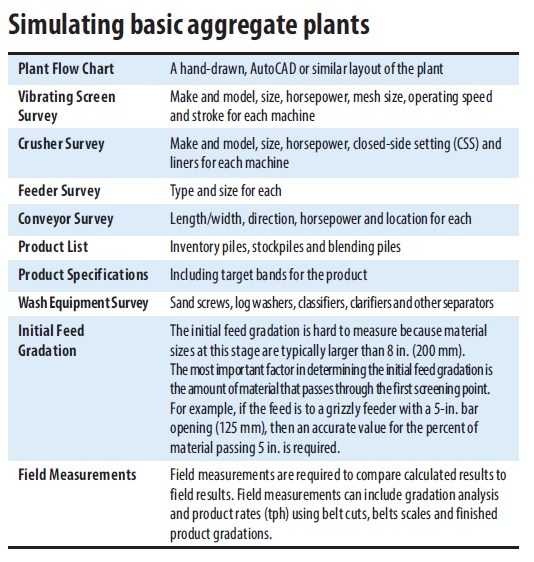 In fact, without plant flow modeling capability, it is almost impossible to simulate – much less manage – the processing options that are available in most aggregate plants. Read the full article at pitandquarry.com.